Annually we report on our subscriber data to provide insights to advisory firm principals as they refine their firm's succession and strategic growth plans. 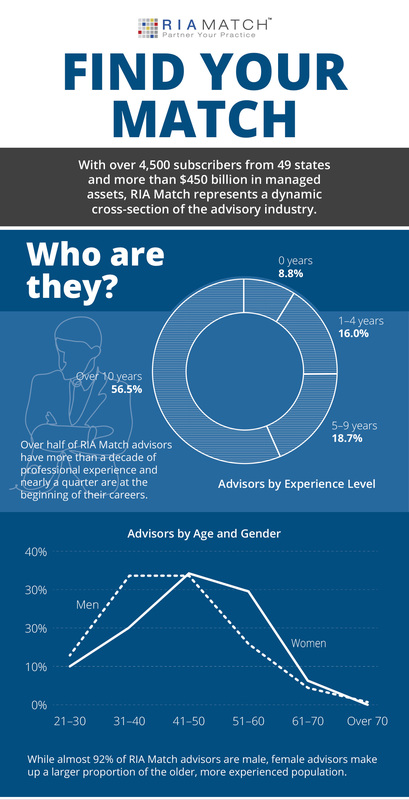 A completed RIA Match profile includes comprehensive information from up to 72 data points. This aggregrated data offers insights from over 4,500 subscribers. 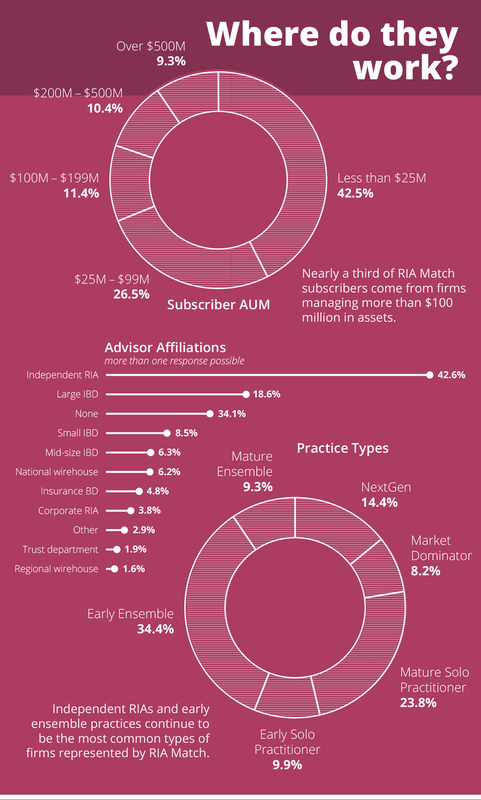 Download the Subscriber Infographic where we provide a snapshot of the advisor types, trends and goals. Be curious and communicate with your matches! RIA Match provides 2 types of service and levels within each type so you can make the best choice for your needs. The RIA Match Platform offers low cost self-service solutions for succession planning and growth. The 3 monthly plans are the free Basic Plan, the Personal Plan ($29.95) and the Premium Plan ($49.95). Learn more at Plans and Pricing. 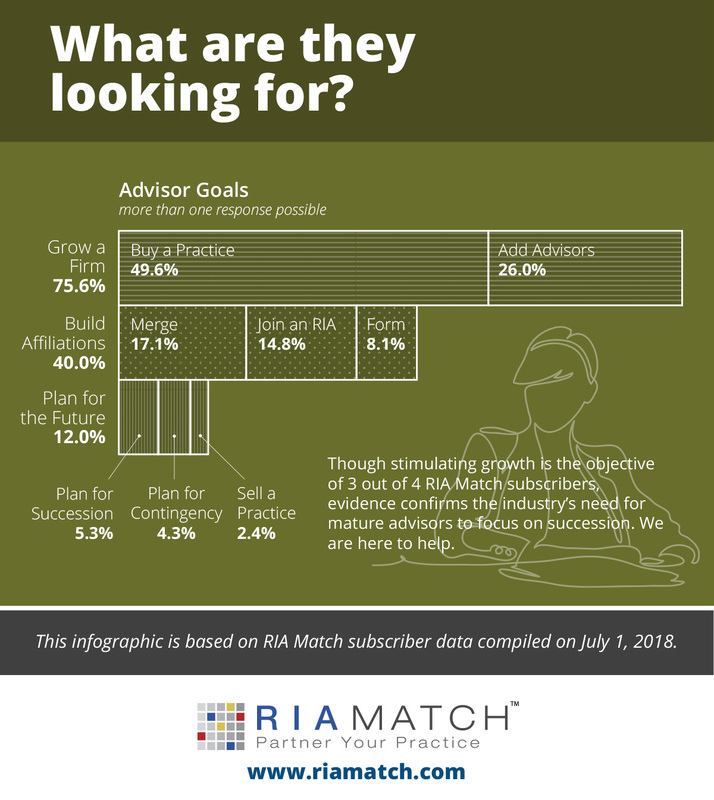 RIA Match Concierge Consulting offers a suite of services for advisors and firm principals considering their potential succession plan glide path. Our services range from a white glove end to end consultation engagement to a limited consulting review. Visit RIA Match Concierge Consulting and contact us to determine what service is best for you.